Mycenaean Greece (c. 1600 BC – c. 1100 BC) is a cultural period of Ancient Greece taking its name from the archaeological site of Mycenae in northeastern Argolis, in the Peloponnese of southern Greece. Athens, Pylos, Thebes, and Tiryns are also important Mycenaean sites. The last phase of the Bronze Age in Ancient Greece, it is the historical setting of much ancient Greek literature and myth, including the epics of Homer. Quite unlike the Minoans, whose society benefited from trade, the Mycenaeans advanced through conquest. The Mycenaean civilization flourished during the period roughly between 1600 BC, when Helladic culture in mainland Greece was transformed under influences from Minoan Crete, and 1100 BC, when it perished with the collapse of Bronze-Age civilization in the eastern Mediterranean. The collapse is commonly attributed to the Dorian invasion, although other theories describing natural disasters and climate change have been advanced as well. The major Mycenaean cities were Mycenae and Tiryns in Argolis, Pylos in Messenia, Athens in Attica, Thebes and Orchomenus in Boeotia, and Iolkos in Thessaly. In Crete, the Mycenaeans occupied Knossos. In addition there were some sites of importance for cults, such as Lerna, typically in the form of house sanctuaries, for the Mycenaeans did not build free-standing temples of the familiar kind. Mycenaean settlement sites also appeared in Epirus, Macedon, on islands in the Aegean, on the coast of Asia Minor, and then in Cyprus. Mycenaean artifacts with Linear B inscriptions have been also found as far away as Germany and Mycenaean swords as far away as Georgia in the Caucasus. Mycenaean civilization was dominated by a warrior aristocracy. Around 1400 BC, the Mycenaeans extended their control to Crete, center of the Minoan civilization, and adopted a form of the Minoan script (called Linear A) to write their early form of Greek in Linear B. Not only did the Mycenaeans defeat the Minoans, but according to later Hellenic legend they defeated Troy, presented in epic as a city-state that rivaled Mycenae in power. Because the only evidence for the conquests is Homer's Iliad and other texts steeped in mythology, the existence of Troy and the historicity of the Trojan War is uncertain. In 1876, the German archaeologist Heinrich Schliemann uncovered ruins at Hissarlik in western Asia Minor (modern-day Turkey) that he claimed were those of Troy. Some sources claim these ruins do not match well with Homer's account of Troy, but others disagree. The Mycenaeans buried their nobles in beehive tombs (tholos tombs), large circular burial chambers with a high vaulted roof and a straight entry passage lined with stone. They often buried daggers or some other form of military equipment with the deceased. The nobility were frequently buried with gold masks, tiaras, armor, and jeweled weapons. Mycenaeans were buried in a sitting position, and some of the nobility underwent mummification, whereas Homer's Achilles and Patroclus were not buried but cremated, in Iron-Age fashion, and honoured with gold urns instead of gold masks. Fresco: the "Lady of Mycenae" accepts a gift of a necklace. No Mycenaean priestly class has yet been identified. Worshiper and worshiped are identified in seals, rings and votive figures through their gestures: worshipers fold their arms, or raise the right arm in greeting, or place a hand on the forehead. Deities lift both arms in the "epiphany gesture" or reach forward to give or receive. The pantheon of Mycenaean deities has been reassembled from inscriptions in Linear B found at Pylos and at post-palatial Mycenaean Knossos in Crete. Some of the deities' names are recognizably present in the Olympic pantheon of written myth. Others are not: Ares, for example, is represented only as "Enyalios" which was retained as an epithet. Apollo may be recognized at Knossos as PA-JA-WO ("Paian"). Far more prominent are A-TA-NA PO-TI-NI-JA (Athena Potnia, "Athena the Mistress"), E-RE-U-TI-JA (Eileithyia, later merely invoked during childbirth), Dionysus, and Poseidon, already the "Earth-Shaker", either with his consort Poseida, who was not retained in the transition to Classical Greece, or, at Pylos, with the "Two Goddesses", apparently Demeter and Persephone. The Erinyes or Furies are already present, as are the Winds. Mycenaean frescoes have been discovered in palace contexts, notably at Pylos, Mycenae, Orchomenos, Thebes, and Tiryns, and in a few non-palatial, perhaps privately-owned contexts. The earliest fresco decorations are of the LH IIA period (ca. 1500 BC). The subjects hold tenaciously to Minoan traditions, whether directly derived or through Cycladic intervention, and have in some cases been reduced to decorative formulas, embodying themes appropriate to their locations: lions and wingless griffins in audience chambers, processional figures in corridors, etc. In a change from the Minoan delight in the life of animals, the Mycenaean relation to nature is reflected in their depictions of animals which are shown only in relation to man or as victims of the hunt. Bull-jumping fresco panels appear at Mycenae and at Tiryns. Around 1100 BC, the Mycenaean civilization collapsed. Numerous cities were sacked, and the region entered what historians describe as a dark age for its lack of inscriptions, with some Mycenaeans fleeing to Cyprus as well as other Greek islands and coastal parts of Anatolia. During this period Greece experienced decreasing population and the limited literacy, connected with bureaucrats of palace culture, disappeared. Historians have traditionally blamed this decline on an invasion or uprising by another wave of Greek people, the Dorians, who may have been a subjugated local people. Alternate theories for the decline also include natural disasters such as a series of earthquakes or large-scale drought, although these recent theories are more controversial. From a chronological perspective, the Late Helladic period (LH, 1550-1060 BC)– is the time when Mycenaean Greece flourished under new influences from Minoan Crete and the Cyclades. Those who made LH pottery sometimes inscribed their work in Linear B, a syllabic script recognizable as a form of Greek. LH is divided into I, II, and III; of which I and II overlap Late Minoan ware and III overtakes it. LH III is further subdivided into IIIA, IIIB, and IIIC. LH pottery typically stored such goods as olive oil and wine. LHI ware had reached Santorini just before the Thera eruption. LHIIB began during LMIB, and has been found in Egypt during the reign of Tuthmosis III. LHIIB spanned the LMIB/LMII destruction on Crete, which is associated with the Greek takeover of the island. LHIIIA:1 corresponds with the reign of Amenhotep III, who recorded with the heading ti-n3-y 'Danaans' (Mycenaean *Danawoi) the apparently equal cities d-y-q-e-i-s 'Thebes' (Mycenaean *Θegʷais) and m-w-k-i-n-u 'Mycenae' (Mycenaean *Mukanai). LHIIIA:1 also corresponds with the time of Attarsiya, the Man of Ahhiya, who alternately attacked and aided the rebel Madduwatta of Zippasla. Ahhiya and its LHIIIA:2-B derivative, Ahhiyawa, can be linked to Greece only indirectly. The Hittites did not use any term approximating ti-n3-y; and they did not link Ahhiya, with these cities, or any other projected LBA names of known Greek cities. Also, no "Attarsiyas layer" of LHIIIA:1 has yet been found in western Anatolia. Still, Ahhiya must refer to a powerful people off the coast of Miletus, and Greece is the best available option at this time. LHIIIA:1-period ti-n3-y / "Ahhiya" (and for that matter LHIIIA:1 Greece) did not feature otherwise in the inscriptions of the great kings of the Bronze Age, and certainly not as a coherent state. LHIIIA:2 ware was in the Uluburun shipwreck, and was in use at Miletus before Mursili II burned it ca 1320 BC. At this time, actual maritime trade was the specialty of the Cypriots and Phoenicians (so the presence of LH ware does not necessarily mean the presence of Mycenaeans). During the LHIIIA:2 period, kings of "Ahhiyawa" began to come to the attention of the Hittites, possibly as rulers of the "Achaean" states. In LHIIIB, they rose almost to the status of the Great Kings in Egypt and Assyria. LHIIIB is also the period of Linear B script at the mainland palaces; prior to then, Linear B was in use primarily in the Cyclades and Crete.Minoians contribuated to the myceneans. The term "Submycenaean" was introduced in 1934 by T. C. Skeat. but this is now regarded as a pottery style rather than a distinct period. Current opinion sees this style as the final stage of Late Helladic IIIC (and perhaps not even a very significant one). Arne Furumark already termed it LHIIIC:2 in his monumental "Mycenaean Pottery: Analysis and Classification" (Stockholm 1941). This pottery is best known from the cemeteries of Kerameikos in Athens, the island of Salamis located in the Saronic Gulf off Attica, Skoubris in Lefkandi (Euboea), and the markets of Athens (Agora), Tiryns, and Mycenae. Since the decipherment of the somewhat younger Linear B tablets, it is thought that the people called Mycenaeans might have been Achaeans or later subjected by them. No written source found at a Mycenaean site reveals what they called themselves. Upon a reading of the Iliad, where the residents of the Peloponnesus and adjacent islands are often called Achaeans, and taking into account mention of the Ahhiyawa in Hittite sources from the Late Bronze Age, the theory suggests itself that the Mycenaeans could possibly even be Achaeans. The Tawagalawa Letter written by an unnamed Hittite king of the empire period (14th-13th century B.C.) to the king of Ahhiyawa, treating him as an equal, suggests that Miletus (Millawanda) was under his control and refers to an earlier "Wilusa episode" involving hostility on the part of Ahhiyawa. Ahhiya(wa) has been identified with the Achaeans of the Trojan War and the city of Wilusa with the legendary city of Troy. However the exact relationship of the term Ahhiyawa to the Achaeans beyond a similarity in pronunciation is hotly debated by scholars, even following the discovery that Mycenaean Linear B is an early form of Greek; the earlier debate was summed up in 1984 by Hans G. Güterbock of the Oriental Institute. In the absence of direct sources, the general political organization of the Mycenaean world cannot be known with certainty. In the tradition recorded centuries later in Homer, there were several states, the cities of the Iliad: Mycenae, Pylos, Orchomenos— which are known to archeology— and perhaps also unconfirmed Sparta or Ithaca. Only the states of Pylos and Knossos are clearly attested in the Linear B texts. Even so, it is impossible to know which was the dominant political center in Argolis, if there indeed was one: Mycenae, Tiryns, or Argos? And what of Athens, the fortified location at Gla, and Iolcos? Connection of the mention of a King of the Ahhiyawa in Hittite sources with the King of the Achaeans, the Mycenaean king Agamemnon of the Iliad, rests on the insecure foundations of an Ahhiyawa/Achaean identity; the very location of the Ahhiyawa kingdom remains a matter for debate: Asia Minor, Rhodes, Peloponesus? On a smaller scale, some uncertain information about the internal organization of the best-known kingdoms, Pylos and Knossos, can be gleaned from sources in Linear B. The state appears to have been ruled by a king, the wa-na-ka (ϝάναξ / wánax), whose role was no doubt military, judicial, and religious. He is identifiable in the Homeric anax (ἄναξ) ("divine lord, sovereign, host"). Nine occurrences of the word in texts having to do with offerings suggest that the sovereigns of Pylos and Knossos were worshiped. However, in Homer the word can also designate a deity. The king was assisted by the ra-wa-ke-ta (lawagetas), no doubt the leader of the army. He and the king each possessed a landed estate, the te-me-no (τέμενος / témenos). Other dignitaries were the te-re-ta (telestai), who appear in the texts as landowners. They perhaps exercised a religious function. The e-qe-ta (equetai), literally, the companions (the knights), formed the entourage of the king. These were the warriors. Besides the members of the court, there were other dignitaries in charge of local territorial administration. The kingdom of Pylos was divided into two great provinces, the de-we-ra ka-ra-i-ja, the near province, and the pe-ra-ko-ra-i-ja, the far province, around the town of re-u-ko-to-ro. The kingdom was further subdivided into seven districts, then into a number of communes. To manage these districts, the king named a ko-re-te (koreter, governor) and a po-ro-ko-re-te (prokoreter, vice governor). A da-mo-ko-ro (damokoros, one who takes care of a damos), in charge of the commune, the da-mo (literally, people, cf. δῆμος / dễmos), and a qa-si-re-u (cf. βασιλεύς / basileús) shared responsibility at the communal level. Their roles are not precisely known; it seems they chaired a council of elders, the ke-ro-si-ja (cf. γερουσία / gerousía). It is, incidentally, interesting to note that in Classical Greece, the basileus is the king, the monarch, as if between the disintegration of Mycenaean society and the Classical Age no higher authority survived — de facto, and then, over the generations, de jure — than the communal official. Mycenaean society appears to have been divided into two groups of free men: the king's entourage, who conducted administrative duties at the palace, and the people, da-mo (demos), who lived at the commune level; these last were watched over by royal agents and were obliged to perform duties for and pay taxes to the palace. Among those who evolved in the palace setting could be found well-to-do high officials who probably lived in the vast residences found in proximity to Mycenaean palaces, but also others, tied by their work to the palace and not necessarily better off than the members of the da-mo: craftsmen, farmers, and perhaps merchants, to name a few. On a lower rung of the social ladder were found the slaves, do-e-ro (masculine) and do-e-ra (feminine) (cf. δούλος / doúlos). These are recorded in the texts as working either for the palace or for specific deities. By the close of the Bronze Age (up to Late Helladic IIIC) contacts between the Aegean and its neighbours were well established. Mycenaean pottery, for example, has been found in Sardinia, Southern Italy and Sicily, Asia Minor (at the settlement of Milawatta (modern Miletus), high-quality Palace style and Mycenaean ceramics have been recovered), Cyprus, Syria-Palestine and Egypt (Especially Tell el Amarna). The circulation of goods and produce between centres are attested in Linear B records, though evidence of direct exchange is not. The economic organization of the Mycenaean kingdoms known from the texts seems to have been bipartite: a first group worked in the orbit of the palace, while another was self-employed. This reflects the societal structure seen above. But there was nothing to prevent a person working for the palace from running his own business. The economy was supervised by scribes, who made note of incoming and outgoing products, assigned work, and were in charge of the distribution of rations. The du-ma-te seems to have been a sort of supervising quartermaster. The territory of the Mycenaean kingdoms of Pylos and Knossos was divided into two parts: the ki-ti-me-na, the palace land, and the ke-ke-me-na, the communal land, cultivated by those the texts call ka-ma-na-e-we, undoubtedly the da-mo. The palace lands are those attested in the texts. One part makes up the te-me-no of the wa-ka-na and of the ra-wa-ge-ta, as seen above. The other part was granted as a perquisite to members of the palace administration. These lands might be worked by slaves or by free men to whom the land had been leased. Agricultural production in these kingdoms reflected the traditional "Mediterranean trilogy": grain, olives, and grapes. The grains cultivated were wheat and barley. Olive orchards were planted for the production of olive oil. This was not only a foodstuff, it was much used as a body oil and in perfume. Grapes were also cultivated, and several varieties of wine were produced. Besides these, flax was grown for linen clothing and sesame for its oil, and trees were planted, such as the fig. Livestock consisted primarily of sheep and goats. Cows and pigs were less common. Horses were kept chiefly for the pulling of chariots in battle. The organization of artisanal labor is especially well known in the case of the palace. The archives of Pylos show a specialized workforce, each worker belonging to a precise category and assigned to a specific place in the stages of production, notably in textiles. The textile industry was one of the principal sectors of the Mycenaean economy. The tablets of Knossos reveal the entire chain of production, from the flocks of sheep to the stocking of the palace storerooms with the finished product, through the shearing and the sorting of the wool in the workshops, as well as working conditions in those workshops. The palace of Pylos employed around 550 textile workers. At Knossos there were some 900. Fifteen different textile specialties have been identified. Next to wool, flax was the fiber most used. The metallurgical industry is well attested at Pylos, where 400 workers were employed. It is known from the sources that metal was distributed to them, that they might carry out the required work: on average, 3.5 kilograms (7.7 lb) of bronze per smith. On the other hand, it is not known how they were paid — they are mysteriously absent in the ration distribution lists. At Knossos, several tablets testify to the making of swords, but with no mention of the true industry of metallurgy. The industry of perfumery is attested as well. Tablets describe the making of perfumed oil. It is known, too, from the archaeology that the workers attached to the palace included other kinds of artisans: goldsmiths, ivory-carvers, stonecarvers, and potters, for example. Olive oil was also made there. Certain areas of endeavor were turned toward export. Commerce remains curiously absent from the written sources. Thus, once the perfumed oil of Pylos has been stored in its little jars, the inscriptions do not reveal what became of it. Large stirrup jars that once contained oil have been found at Thebes, in Boeotia. They carry inscriptions in Linear B indicating their place of origin, western Crete. However, Cretan tablets breathe not a word about the exportation of oil. There is little information about the distribution route of textiles. It is known that the Minoans exported fine fabrics to Egypt; the Mycenaeans no doubt did the same. Indeed, it is probable that they borrowed knowledge of navigational matters from the Minoans, as is evidenced by the fact that their maritime commerce did not take off until after the founding of the Minoan civilization. Despite the lack of sources, it is probable that certain products, notably fabrics and oil, even metal objects, were meant to be sold outside the kingdom, for they were made in quantities too great to be consumed solely at home. Archaeology can, however, shed some light on the matter of the exportation of Mycenaean products outside of Greece. A number of vases have been found in the Aegean, in Anatolia, the Levant, Egypt and also farther west in Sicily, even in Central Europe and as far away as Great Britain. In a general way, the circulation of Mycenaean goods is traceable thanks to nodules, ancestors of the modern label. They consisted of small balls of clay, molded with the fingers around a lanyard (probably of leather) with which they were attached to the object. The nodule displayed the imprint of a seal and an ideogram representing the object. Other information was sometimes added: quality, origin, destination, etc. Fifty-six nodules found at Thebes in 1982 carry an ideogram representing an ox. Thanks to them, the itinerary of these bovines can be reconstructed. From all over Boeotia, even from Euboea, they were taken to Thebes to be sacrificed. The nodules served to prove that they were not stolen animals and to prove their origin. Once the animals arrived at their destination, the nodules were removed and gathered to create a book-keeping tablet. The nodules were used for all sorts of objects and explain how Mycenaean book-keeping could have been so rigorous. The scribe did not have to count the objects themselves, he could base his tables upon the nodules. (See also 'figures and figurines' below) The religious element is difficult to identify in Mycenaean civilization, especially as regards archaeological sites, where it remains problematic to pick out a place of worship with certainty. John Chadwick points out that at least six centuries lie between the earliest settling of proto-Greek speakers in Hellas and the earliest Linear B inscriptions, during which concepts and practices will have fused with indigenous beliefs, and— if cultural influences in material culture reflect influences in religious beliefs— with Minoan religion. As for these texts, the few lists of offerings that give names of gods as recipients of goods reveal nothing about religious practices, and there is no surviving literature. John Chadwick rejected a confusion of Minoan and Mycenaean religion derived from archaeological correlations and cautioned against "the attempt to uncover the prehistory of classical Greek religion by conjecturing its origins and guessing the meaning of its myths" above all through treacherous etymologies. Moses I. Finley detected very few authentic Mycenaean reflections in the eighth-century Homeric world, in spite of its "Mycenaean" setting. The Mycenaean pantheon already included numerous divinities that can be found in Classical Greece. Poseidon seems to have occupied a place of privilege, notably in the texts of Knossos. He was probably at this period a chthonic deity, connected with earthquakes. Also to be found are a collection of "Ladies" like the Lady of the Labyrinth at Knossos in Crete, who calls to mind the myth of the Minoan labyrinth, in keeping with the presence of a figure named Daedalus. There is also a "Sea Goddess" named Diwia. Other divinities who can be found in later periods have been identified, such as the couple Zeus–Hera, Ares, Hermes, Athena, Artemis, Dionysus and Erinya. Notably absent are Apollo, Aphrodite, Demeter (divinities of Eastern origin), Hephaestus, and Herakles. No great temple has been identified for the Mycenaean epoch: the familiar free-standing temple containing a cult image in its cella with an open-air altar before it, was a later development. Certain buildings found in citadels having a central room, the megaron, of oblong shape surrounded by small rooms may have served as places of worship. Aside from that, the existence of a domestic cult may be supposed. Some shrines have been located, as at Phylakopi on Melos, where have been found a considerable number of statuettes undoubtedly fashioned to serve as offerings, and it can be supposed from their archaeological strata that sites such as Delphi, Dodona, Delos, Eleusis and Abae were already important shrines, and in Crete several Minoan shrines show continuity into LM III, a period of Minoan-Mycenaean culture. The principal Mycenaean towns were well fortified. The town could be situated on an acropolis as in Athens or Tiryns, against a large hill as in Mycenae, or on the coastal plain, like Gla or Pylos. Besides the citadels, there are also isolated forts that undoubtedly served to militarily control territory. Mycenaean walls were often made in a fashion called cyclopean, which means that they were constructed of large, unworked boulders up to eight meters (26 ft) thick, loosely fitted without the clay mortar of the day. Different types of entrances or exits can be seen: monumental gates, access ramps, hidden doors, and vaulted galleries for escaping in case of a siege. Fear of attack meant that the chosen site must have a cistern or well at its disposal. The Mycenaean sites are composed of different types of residences. The smallest are rectangular in form and measure between 5 and 20 metres (16–66 ft) on a side. These were the houses of the lowest classes. They could have one or several rooms; the latter become more widespread in more recent periods. On a more developed level are found larger residences, measuring about 20 to 35 meters (66 to 115 ft) on a side, made up of many rooms and central courtyards. Their layout resembles that of a palace. It is not, however, certain that these were indeed the residences of the Mycenaean aristocrats; another theory is that they were palace annexes, being often situated next to them. The best examples of the Mycenaean palace are seen in the excavations at Mycenae, Tiryns and Pylos. That these were administrative centers is shown by the records found there. From an architectural point of view, they were the heirs of the Minoan palaces and also of other palaces built on the Greek mainland during the Middle Age. They were ranged around a group of courtyards each opening upon several rooms of different dimensions, such as storerooms and workshops, as well as reception halls and living quarters. The heart of the palace was the megaron. This was the throne room, laid out around a circular hearth surrounded by four columns, the throne generally being found on the right-hand side upon entering the room. The staircases found in the palace of Pylos indicate palaces had had two stories. Located on the top floor were probably the private quarters of the royal family and some storerooms. These palaces have yielded a wealth of artifacts and fragmentary frescoes. The most recent find is a Mycenaean palace near the village of Xirokampi, in Laconia. As of early 2009, the excavation is at its first stages and artifacts uncovered so far include clay vessels and figurines, frescoes and three Linear B tablets. Preliminary findings indicate that one the tablets contains an inventory of about 500 daggers and another is an inventory for textiles. The discovery was announced at the Athens Archaeological Society on April 28, 2009. Contrary to an often held view, some Mycenaean representative buildings already featured roofs made of fired tiles, as in Gla and Midea. In 1930, a building for the National Bank was built at Nafplio in Mycenaean Revival style. Silver repoussé rhyton with gold horns, from Grave Circle A at Mycenae, 16th century BC (Archaeological Museum, Athens). Mycenaeans made a great deal of pottery. Archaeologists have found a great quantity of pottery from the Mycenaean age, of widely diverse styles—stirrup jars, pitchers, kraters, chalices sometimes called "champagne coupes" after their shape, etc. The vessels vary in size. Their conformations remained quite consistent throughout the Mycenaean period, up through LHIIIB, when production increased considerably, notably in Argolis whence came great numbers exported outside Greece. The products destined for export were generally more luxurious and featured heavily worked painted decorations incorporating mythic, warrior, or animal motifs. Another type of vessel, in metal (normally bronze), has been found in sizeable quantities at Mycenaean sites. The forms of these were rather tripods, basins, or lamps. A few examples of vessels in faience and ivory are also known. The Mycenaean period has not yielded sculpture of any great size. The statuary of the period consists for the most part of small terracotta figurines found at almost every Mycenaean site in mainland Greece, in tombs, in settlement debris, and occasionally in cult contexts (Tiryns, Agios Konstantinos on Methana). The majority of these figurines are female and anthropomorphic or zoomorphic. The female figurines can be subdivided into three groups which were popular at different periods: the earliest are the Phi-type: these look like the letter phi and their arms give the upper body of the figurine a rounded shape. The Psi-type looks like the letter psi: these have outstretched upraised arms. The latest (12th century BC) are the Tau-type: these figurines look like the Greek letter tau: with folded(?) arms at right angles to the body. Most figurines wear a large 'polos' hat. They are painted with stripes or zigzags in the same manner as the contemporary pottery and presumably made by the same potters. Their purpose is uncertain, but they may have served as both votive objects and toys: some are found in children's graves but the vast majority of fragments are from domestic rubbish deposits. The presence of numbers of these figurines on sites where worship took place in the Archaic and Classical periods (c 200 below the sanctuary of Athena at Delphi, others at the temple of Aphaia on Aegina, at the sanctuary of Apollo Maleatas above Epidauros and at Amyklae near Sparta, for example), suggests both that many were indeed religious in nature, perhaps as votives, but also that later places of worship may well have first been used in the Mycenaean period. The painting of the Mycenaean age was much influenced by that of the Minoan age. Fragments of wall paintings have been found in or around the palaces (Pylos, Mycenae, Tiryns) and in domestic contexts (Zygouries) while the largest complete wall painting depicting three female figures, probably goddesses, was found in the so-called Cult Centre at Mycenae. Various themes are represented: hunting, bull leaping (tauromachy), battle scenes, processions etc. Some scenes may be part of mythological narratives, but if so their meaning eludes us. Other frescoes include geometric or stylised motifs, also used on painted pottery (see above). Military items have been found among the treasures of the Mycenaean age. 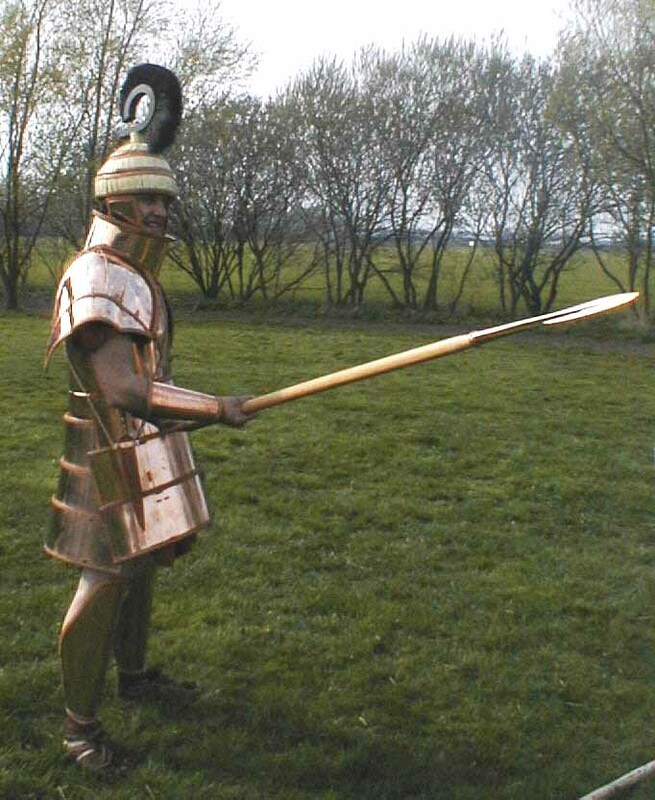 The most impressive work is that of the Dendra panoply, a complete suit of Mycenaean armor. The cuirass is made up of bronze plates sewn to a leather garment. The weight of this armor must have hindered the mobility of a warrior, and it is for this reason it is supposed that it was worn by a warrior riding in a chariot. The typical Mycenaean helmet, in use from the seventeenth to the tenth centuries BC, was made of cut segments of boar's tusk sewn to a leather or cloth backing. This type is illustrated in ivory relief plaques found in the shaft graves of the seventeenth and sixteenth centuries BC and in wall paintings of that era from Akrotiri on Thera (Santorini) and of the thirteenth century BC in the so-called Palace of Nestor at Pylos. Groups of boar's tusk plates from the helmets themselves have been found at many sites, including Mycenae, Prosymna, Thermon and Elateia, as well as in southern Italy. This is the type of helmet which is described by Homer several hundred years later. Two types of shields were used: the "figure eight" or "fiddle" shield, and a rectangular type, the "tower" shield, rounded on the top. They were made of wood and leather, and were of such a large size that a warrior could completely cower behind his shield. Offensive arms were made of bronze. Spears and javelins have been found, and also an assortment of swords of different sizes, designed for striking with the point and with the edge. Daggers and arrows, attesting to the existence of archery, compose the remainder of the armament found from this period. The usual form of burial in the Late Helladic was inhumation. The dead were almost always buried in cemeteries outside the residential zones and only exceptionally within the settlements (the most famous burials in Grave Circle A originally lay outside the citadel and were only brought within it when the citadel wall was extended c 1250 BC). The earliest Mycenaean burials were mostly in individual graves in the form of a pit or a stone lined cist and offerings were limited to pottery and occasional items of jewellery. A large cemetery with burials of this kind spread around the northern and western slopes of the citadel at Mycenae. Groups of pit or cist graves containing elite members of the community were sometimes covered by a tumulus (mound) in the manner established since the Middle Helladic period. It has been argued that this form dates back to the oldest periods of Indo-European settlement in Greece, and that its roots are to be found in the Balkan cultures of the third millennium BC, and even the Kurgan culture but an indigenous development is more likely. Pit and cist graves remained in use for single burials throughout the Mycenaean period alongside more elaborate family graves(see below). The shaft graves at Mycenae within the two grave circles (A+B) belong to the same period and seem to represent an alternative manner of grouping elite or royal burials - and isolating them from those of the majority. Circle B is the earlier of the two groups, already in use in the MH period, and contains lavish grave goods - gold and silver, jewellery, weapons and pottery. Circle A, excavated by Heinrich Schliemann enclosed fewer but extraordinarily well provided graves. Beginning also in the Late Helladic are to be seen communal tombs of rectangular form. It is difficult to establish whether the different forms of burial represent a social hierarchization, as was formerly thought, with the tholoi being the tombs of the elite rulers, the individual tombs those of the leisure class, and the communal tombs those of the people. Cremations increased in number over the course of the period, becoming quite numerous in LH III C. This is perhaps proof of the arrival of a new population in Greece. The most impressive tombs of the Mycenaean era are the monumental royal tombs of Mycenae, undoubtedly intended for the royal family of the city. The most famous is the Tomb of Agamemnon (the Treasury of Atreus), which is in the form of a tholos. Nearby are other tombs (known as "Circle A"), popularly identified with Clytemnestra and Aigisthos. All contained impressive treasures, exhumed by Schliemann during the excavation of Mycenae. It has been argued that different dynasties or factions may have competed through conspicuous burial, whereby grave circle A represents a new faction in the ascendancy (at this time, LH I, the relative wealth and consistency of 'B' burials declines). The Mycenaean "tholoi" may, again, represent another factional grouping, or a further formalization in burial practices by the faction previously buried in A. Nevertheless, there is a demonstrably apparent expansion in relative size, wealth/cost expenditure, and visibility in the construction of these graves over this period, coinciding with increased foreign/trading contacts and the further entrenchment of the palatial economy. The timing and interpretation of the end Mycenaean period poses an array of questions that have yet to be answered. The end of LH III B1 was marked by some destruction, in particular at Mycenae. By LH III B2, an augmentation of the Mycenaean systems of defense can be seen, a sign of increasing insecurity. But this does not seem to have been a period of crisis, because these levels have yielded archaeological material that bespeaks a degree of wealth in no way inferior to that of previous periods. The end of this period is nevertheless marked by a number of destructions in the greater part of the Mycenaean sites on mainland Greece. 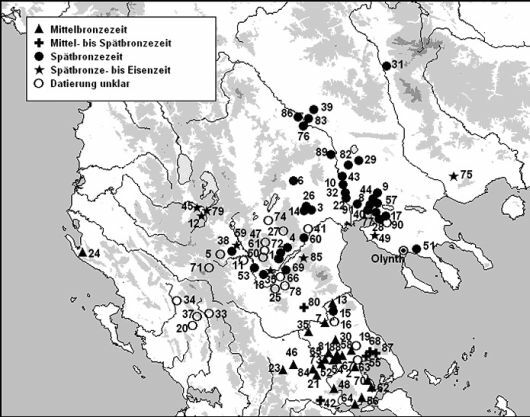 LH III C saw a decrease in the number of sites in Greece, which might have been considerable in certain regions (nine-tenths of the sites in Boeotia disappeared, and twot Mycenaean traits, such that LH III C is considered to be a level of Mycenaean civilization. However, a new type of ceramic appeared, called "barbarian" because it was formerly attributed to foreign invaders, and there was also a continuing increase in the practice of cremation. Several explanations have been advanced for the causes of the decline of Mycenaean civilization in this period. Those concerning natural factors (climate change, earthquakes) are considered more controversial. The two most common theories are population movement and internal conflict. The first attributes the destruction of Mycenaean sites to invaders. Sometimes the Dorians are invoked, sometimes the Sea People. The movements of people occurring from the Balkans to the Middle East at this period, mentioned in Egyptian inscriptions calling the invaders by the name of the "Sea People", are quite real. It is known that these people were responsible for numerous destructions in Anatolia and the Levant. Mention of a people called Eqwesh (which recalls the term Achaean) in an Egyptian text of the 12th century BC has caused specialists to suppose that the Mycenaeans had taken part in these invasions (this is not certain). There is little else to tell us what happened in the Greek world. There is the second theory, which has the Mycenaean civilization falling in the course of internal societal conflicts brought on by a rejection of the palatial system by the most underprivileged strata of society, who were impoverished at the end of the Late Helladic. This hypothesis is sometimes joined with the preceding one, mingling social divisions with ethnic divisions. In this context it has to be stressed, that the beginning Iron Age made large numbers of comparatively cheap weapons accessible. An economic factor, that is also seen as a root cause of the apparition of the "sea peoples" in Egypt and the destruction of Ugarit and the Hittite Empire. Whatever were the causes, the Mycenaean civilization had definitely disappeared after LH III C, when the sites of Mycenae and Tirynth were again destroyed and lost their importance. This end, during the last years of the 12th century BC, occurs after a slow decline of the Mycenaean civilization, which lasted many years before dying out. The beginning of the 11th century BC opens a new context, that of the protogeometric, the beginning of the geometric period, the Greek Dark Ages of traditional historiography. ^ Burkert, Walter. Greek Religion, p. 121; Meyer, E. RE Suppl. XIV, pp. 813–815. ^ See sources cited at Homeric Troy. ^ For a fuller synopsis of Mycenaean frescoes, see the relevant section of Prehistoric Archaeology of the Aegean, Dartmouth College. ^ Skeat, T.C., The Dorians in Archeology, (London: Alexander Moring) 1934. ^ Oliver Dickinson, "The Aegean from Bronze Age to Iron Age", London 2006, 14-15. ^ Hans G. Güterbock, "The Hittites and the Aegean World: Part 1. The Ahhiyawa Problem Reconsidered" American Journal of Archaeology 87.2 (April 1983), pp. 133–138; and Machteld J. Mellink, "Part 2. Archaeological Comments on Ahhiyawa-Achaians in Western Anatolia", pp. 138–141. ^ G.L. Huxley, Achaeans and Greeks (1960); see Achaeans (Homer)#Hittite documents. ^ Hans G. Güterbock, "Hittites and Akhaeans: A New Look" Proceedings of the American Philosophical Society 128.2 (June 1984), pp. 114–122. Bibliography. ^ Preziosi, D. and Hitchcock L.A. (1999). Aegean Art and Architecture, p. 195. ^ Chadwick 1976 "Religion", pp 84-102, p. 88. ^ Explicitly as expressed in M.P. Nilsson, The Minoan-Mycenaean Religion and Its Survival in Greek Religion, 1927. ^ "Words that are not understood are constantly deformed to give them meanings. Mere resemblance is of course nearly always deceptive." (Chadwick 1976:87). ^ E. B. French 1971 ‘The Development of Mycenaean Terracotta Figurines’, Annual of the British School of Archaeology at Athens 66, 101–87. ^ See account of their use in K.A. and Diana Wardle 'The Child's Cache at Assiros, Macedonia', in Sally Crawford and Gillian Shepherd (Eds): Children, Childhood and Society: Institute for Archaeology and Antiquity Interdisciplinary Studies Vol I Archaeopress, Oxford 2007. ^ Charbonneaux, J. and Demangel, M. Fouilles de Delphes ii, fascicule 2-3. Paris 1925. Hägg, R. ‘Official and Popular Cults in Mycenaean Greece’ in Sanctuaries and Cults in the Aegean Bronze Age, R. Hägg and N. Marinatos (eds.). Stockholm 1981. ^ Hammond, “Tumulus Burial in Albania, the Grave Circles of Mycenae, and the Indo-Europeans,” Annual of the British School at Athens, 62 (1967), p. 90. Shear, Ione Mylonas. "Excavations on the Acropolis of Midea: Results of the Greek–Swedish Excavations under the Direction of Katie Demakopoulou and Paul Åström". American Journal of Archaeology, January 2000, 104(1):133–134. Wikander, Orjan. "Archaic Roof Tiles the First Generations". Hesperia, 59(1):285–290, January-March, 1990. French, Elizabeth (2002). Mycenae: Agamemnon's Capital. Tempus. K.A. and Diana Wardle (1997, 2000). Cities of Legend: The Mycenaean World. Bristol Classical Press. Weiss, Barry: (1982) "The decline of Late Bronze Age civilization as a possible response to climatic change" in Climatic Change ISSN 0165-0009 (Paper) 1573-1480 (Online), Volume 4, Number 2, June 1982, pp. 173–198.